When planning fin tubes, perfect timing is a rare and precious element every bit as valuable as diamonds or gold. In fact, time can fundamentally be the most expensive variable in the equation of any fin tubing project. In a nutshell, you need to tell your fin tubes manufacturer what you need, when you need it, and which of those details might only be an educated guess. Assuring that your finned tube manufacturer knows those specifics can make all the difference in whether or not your finned tube design gets off the ground and how much that will cost. Let’s examine 3 ways bad timing can ruin your finned tube project, or at least skyrocket its price tag by potentially thousands or perhaps even hundreds of thousands of dollars. 1. You get played by the market instead of playing the market. The market for metals jumps daily. Every day opens and closes at a different price. A great finned tubing manufacturer watches these prices like Warren Buffet reads the Wall Street Journal. They see what’s going on and can make a highly educated guess as to what will happen next. When you tell your manufacturer what you need and when they can be better prepared to buy the necessary metals when prices are low. Mills have their own schedules and demands. There may be freight issues to wrangle. The goal is to be ahead of the demand, and that requires planning. When you’re racing a deadline, you are forced to pay for whatever the piper’s playing at that given moment. It’s very easy to walk right off the side of a market cliff. 2. You don’t have enough in stock to solve supply issues before problems come knocking. Anybody with kids knows a stocked fridge is like an ice-cube in July. Inventory tends to evaporate right before your very eyes. Some specialty markets may require as many as 14 to 16 weeks to obtain at an optimal price point. We advise most of our clients budget inventory at least a quarter in advance, some even six months into the future. That way your manufacturer has the time to shop around to find the very best deal. You may think those 100,000 pieces you have in storage are plenty. But if you go through 25,000 pieces a month, in four months your stock is picked clean. And with a lead time of 14 weeks, you’ll soon have an inventory problem the size of a grizzly bear knocking on your front door. 3. The future’s a busy street: If you don’t look left to right, you’ll be a squirrel on the run. You don’t just have to plan for what you need now. You also have to prepare for what might be coming down the road and tell your finned tube manufacturer every possibility in detail. Open communication is essential to planning your need for fin tubes long before you have them. We encourage our clients to give us reports monthly or even weekly. We need to know not only what is currently going on, but what you anticipate coming down the road. That way we can design a schedule to get the materials and products arranged proactively at the best possible price point. Even it’s only an educated guess at best, it is important to let your manufacturer know so they can anticipate with their supply chain and have the necessary materials on hand. If you need options, communicate the specifics so they can plan accordingly. Otherwise, you’ll be just another squirrel scampering between the tires of a four-lane highway. The Thousand Dollar Question: When Do You Need It? Great timing is the crown jewel to any fin tubing project. The significance of its value cannot be overstated. The savings can prove highly significant. Without planning the timing of material purchases, a finned tube manufacturer may be forced to expedite materials for thousands of dollars more than necessary. The differences can be 5 to 10 times more expensive than what proactive timing could otherwise deliver. Every customer of fin tubes plans their entire production line on a gamble that the required materials will be there when they need them. That’s why your manufacturer needs to be in constant communication with their supply chain, and they need the timing to be able to plan and optimize those material purchases strategically. The fin tubes industry lives and thrives on the manufacturing of JIT, or Just in Time, in which parts are supplied as needed. But in order to make it all work just in the nick of time, you need to proactively consider your materials months in advance and communicate those needs to your provider. Failure to plan and communicate critical needs can literally result in thousands of dollars of avoidable expense, a deadlocked project, or a failed finned tube design lost to the smoke of a pipe dream. 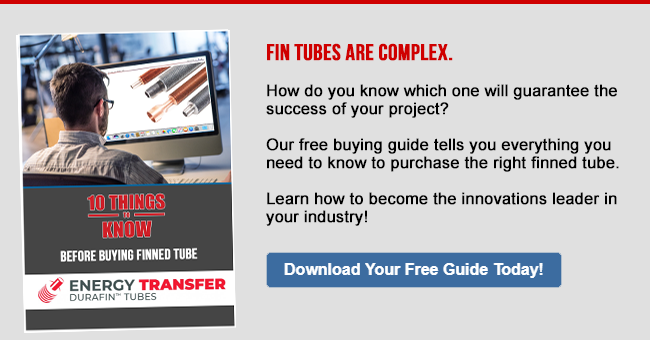 Want the best use and price optimization for your fin tubes? In our step by step guide, learn how to build the perfect heat exchanger and optimize energy savings. 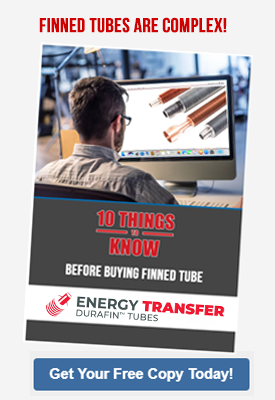 Download our FREE GUIDE, “10 Things to Know Before Buying Finned Tube” today! Have a question about fin tubes? We’re happy to help! Schedule a FREE consultation!